The two-day International Workshop on Disaster Resilient Infrastructure (IWDRI) successfully concluded here today. Experts from 33 countries representing a wide variety of development and disaster risk contexts, multilateral development banks, the United Nations, the private sector, academia, policy think tanks and other stakeholders participated in the workshop. In his special address, the Chairman of the 15th Finance Commission of India, Shri N. K. Singh called for collective action on resilient infrastructure so that people-centric solutions are found. “As millions of people will continue to move to towns and cities in the near future, urban resilience will be the key for sustainability”, said Dr. Rajiv Kumar, Vice-Chairman, NITI Aayog, while delivering the inaugural address. He added “it is the States where all the action happens and urged working in collaboration with State Governments for better results. Reiterating the importance of disaster resilient infrastructure in achieving sustainable development goals, the Additional Principal Secretary to the Prime Minister, Dr. P. K. Mishra proposed three mantras for achieving sustainability in DRI – the need to focus on the poor and the vulnerable; to follow an inclusive approach of collaboration with multiple stakeholders; and ensure proactive connectedness with other Global Processes in DRR. The Workshop identified good practices of disaster risk management in key infrastructure sectors such as Transport, Energy, Telecom and Water. It also discussed emerging technologies and nature-based innovation in the context of climate change and its impact on creation, operation and maintenance of infrastructure. The need and practical issues concerning finance and insurance for infrastructure were also discussed during the workshop.It set the stage for taking the dialogue on the proposed Coalition for DRI (CDRI) forward at the global level. The CDRI is envisaged as a knowledge exchange and capacity development partnership. India had announced the creation of a CDRI soon after the Asian Ministerial Conference on Disaster Risk Reduction, which was held in New Delhi in 2016. 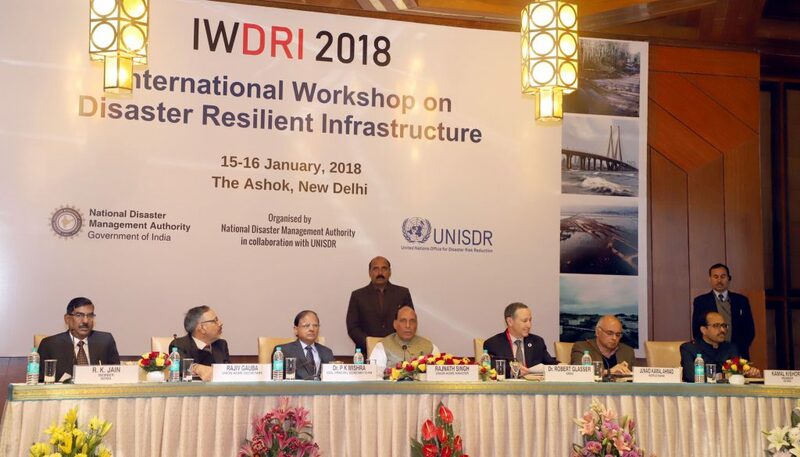 The Second IWDRI was organised by the National Disaster Management Authority (NDMA) jointly with United Nations Office for Disaster Risk Reduction (UNISDR), and in partnership with the Global Commission on Adaptation, United Nations Development Programme and the World Bank. Various international agreements have also reiterated the importance and long-term benefits of investing in resilient infrastructure. The Sendai Framework for Disaster Risk Reduction (SFDRR), 2015-2030, which is the first major agreement of the post-2015 development agenda, identifies investing in Disaster Risk Reduction (DRR) for resilience and to build back better in reconstruction as priorities for action towards reducing disaster risk. Similarly, Goal 9 of the Sustainable Development Goals (SDGs) recognizes disaster resilient infrastructure as a crucial driver of economic growth and development.